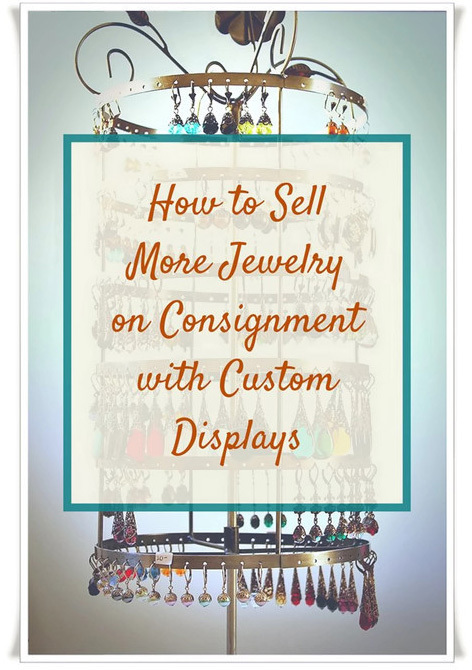 Coming up with effective jewelry display ideas can mean the difference between selling on consignment to a store or being turned away. Most stores have limited availability for displaying jewelry. Counter space and horizontal space is really at a premium. With some inexpensive materials, a little elbow grease and clever planning, you can design a display unit that does not take up horizontal space and utilizes lots of vertical merchandising space. An example of this would be a tall rectangular frame, let's say five feet tall by fifteen inches wide with four sides. The structure would be attached to a lazy susan and the frame would have dowels or even slats along each side. With a display like this you could literally display 60 to 100 cards with jewelry. This is a practical free standing display that turns easily and can be viewed from all four sides. That means prime selling space for your product. Another great idea would be to make or purchase a fairly tall earring rack that could sit on a counter. The earring racks that I make usually hold 35 to 40 earrings per rack. Be creative with your jewelry display ideas. There is another advantage to making and supplying custom displays for your work. Having your own display is a great way to get into retail outlets who do not currently sell jewelry. I have encountered many stores over the years that have an interest in jewelry, but they had no way of displaying it. Why not be the first jewelry designer to get your work into a store on consignment by providing the shop with an easy and free display designed solely for the purpose of exhibiting your work. For a store to venture into selling jewelry it takes not only investment, but time and know-how. Many store owners wouldn't even know how to begin displaying jewelry or where to get the right displays if they have never sold jewelry before. As a good sales person you need to learn to solve the customer's problem and cater to their needs. If you have an appealing display that is easy to use and showcases your work well, you may be able to consign your jewelry to many more stores and have a unique advantage over other jewelry designers. If you plan to provide displays for stores it would be a good idea to include the display in your contract and be clear that the display provided is for your work only. Then be sure to provide enough jewelry so that the rack can be replenished and check in often to fill in stock when need be. Stores will not be very happy to house a large display that you cannot fill regularly. When designing a display system make sure it will hold only the quantity that you can commit to filling. Leave enough stock to replenish the rack right from the beginning. Providing a complete self contained package that holds just the right amount of stock that you can always stay on top of, shows you are reliable and you will look like a star! Consider building a display system that is large enough to represent a good deal of your work, but not so large that stores might be hesitant to use it. Better yet, offer both a large or medium display filled with your work and photograph it. This way the store owners can decide which size is more suitable. When speaking to store owners, having a photo of your display offering, complete with measurements as well as some samples of your line, is an easy and portable way to present your whole package. It is a good way of giving the store a visual of the options without having to drag around a display unit. visit second hand and antique stores for inexpensive items that can be quickly converted into unique jewelry displays. art stores have tons of products to get started and inspire creative jewelry display ideas such as, unfinished wood frames, foam core and wood frames for stretching canvas. hobby shops are my favorite place to pick up flat metal strips to use for earring racks. All you have to do is mark out even hole placements with a sharpie marker and punch the holes, then attach them to your frame. building centers such as Home Depot have a myriad of products like dowels, copper wire, shutter panels etc. look for creative jewelry display ideas at places like Ikea and kitchen stores. You will be surprised how you can convert functional items for display purposes. Keep up-to-date with interior design trends and try to keep your displays looking clean and contemporary in order to entice store owners. Stay away from dated or "crafty" looking display units. Make your displays in neutral color palettes to better fit with most store furnishings.